Rubber air hoses are Made-In-America by GOODYEAR from top quality natural rubber compounds and is highly abrasion resistant. Tough and durable and made for those who demand performance from their air tools and air hose. Designed for air hammer tool applications on construction sites. 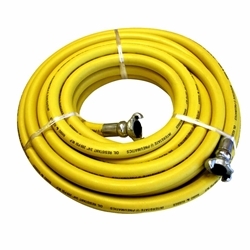 This hose comes standard with a 3/4" Universal Twist lock. These twist lock couplings are secured by two metal bands. The IP hose is crimped with a steel ferrule. Constructed of heavy-duty, reinforced rubber for durability, the Goodyear Rubber Hose provides industrial-level performance in all temperatures. 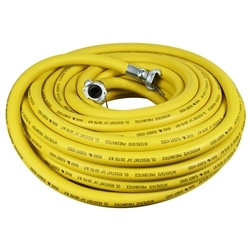 Ideal for a wide range of home and jobsite applications, this heavy-duty hose is designed to stand up to the demands of your job. Interstate Pneumatics, brand new, 3/4" x 100 ft 200 PSI Jack Hammer Red Rubber Hose, HJ19-100E. Interstate Pneumatics rubber air hose is tough and durable and made for those who demand performance from their air tools and air hose. These rubber air hoses are the best quality rubber hose on the market. Designed to help power all types of pneumatic tools including staple guns, brad nailers, spray guns, air ratchets and more. 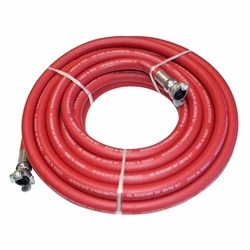 Interstate Pneumatics HA46-600E Red Rubber Hose EPDM. Interstate Pneumatics rubber air hose is tough and durable and made for those who demand performance from their air hose. A synthetic rubber hose with great durability and excellent colour stability along with outstanding resistance to severe weather conditions, heat and ozone. Tough, synthetic rubber tube offers excellent strength and flexibility. This all-purpose industrial air hose is oil, gas and ozone resistant to handle a wide variety of jobs in the home, shop or garage. 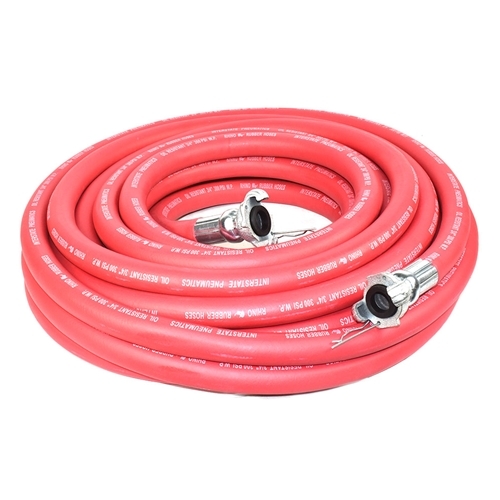 This rubber air hose is ideal for rugged applications where the hose may be dragged over concrete or other rough surfaces. The rubber construction offers very good cold weather flexibility and coils easily for storage. It is ideal for garage, shop, industry, home and many other uses. 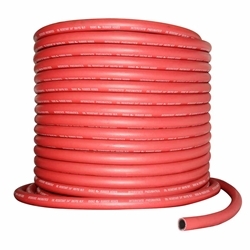 IP Rubber air hoses are made from top quality natural rubber compounds and is highly abrasion resistant. Tough and durable and made for those who demand performance from their air tools and air hose. Designed for air hammer tool applications on construction sites. 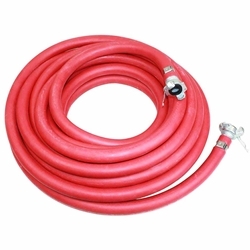 This hose comes standard with a 3/4" Universal Twist lock. These twist lock couplings are secured by two metal bands. The IP hose is crimped with a steel ferrule. Constructed of heavy-duty, reinforced rubber for durability, the Goodyear Rubber Hose provides industrial-level performance in all temperatures. Ideal for a wide range of home and jobsite applications, this heavy-duty hose is designed to stand up to the demands of your job.